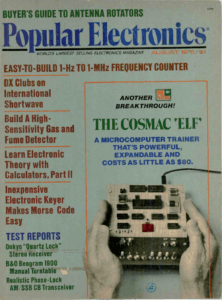 Way before there was a Raspberry Pi, there was the COSMAC Elf, a micro computer with a micro price tag. In light of the recent addition of the RCA CDP1802 into the IEEE’s Chip Hall of Fame, this week’s blog post is dedicated to the COSMAC Elf, a handy little build-it-yourself computer that utilized the 1802. Portable wasn’t exactly a word that one could use to describe computers in the late 1960s. Cheap also didn’t apply, and neither did personal. However, in the 1970s, this would all change thanks to the 1971 invention of the microprocessor. Computers could now be smaller and cheaper, and, thanks to articles in hobbyist magazines like Popular Electronics, they could also be built and used by the general public. The first (and most famous) of these was the Altair 8800, featured on the cover of the January 1975 issue, but it wasn’t the only one. 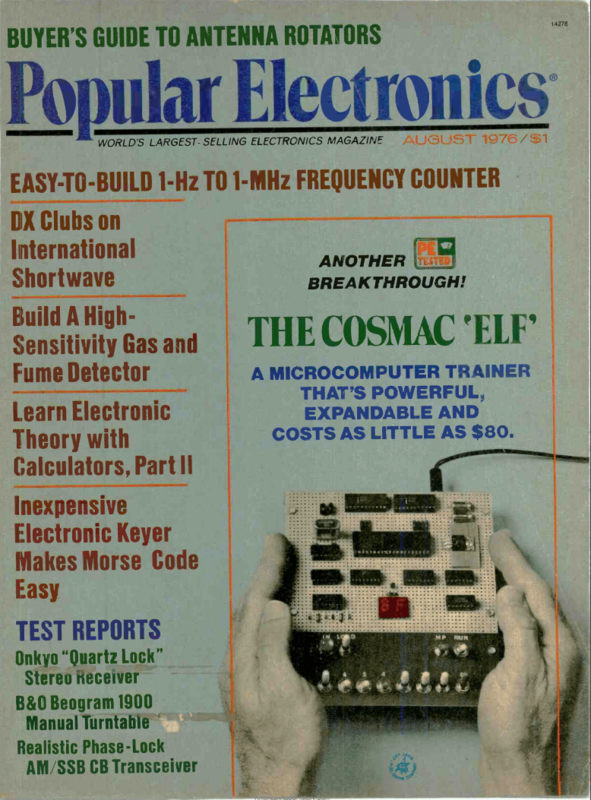 A few months later, the magazine featured another microcomputer on the front page of its August 1976 issue, the COSMAC Elf, a powerful, expandable, and most importantly, cheap build-it-yourself computer. While the Altair was relatively expensive, the Elf could be made for about $80, or $100 if you added a video display. The article’s author was Joseph Weisbecker, an engineer at RCA Labs in Princeton. RCA was not known for its computers, except, perhaps, as the punchline to a joke, even though its involvement in computing began in the late 1930s. In the 1940s and early 50s, engineers at the company designed vacuum tube memory systems and later magnetic core memory boards. In November of 1955, RCA entered the computer market more forcefully with the BIZMAC, a 20,000 square foot vacuum-tube computer meant for business and data-processing. It was not a commercial success, especially since it was competing with faster, cheaper, and simpler transistor-based computers like the IBM 700 series. RCA attempted to win back some of the market with its own transistorized computers—the 301 and the 501. While these computers sold moderately well, consumers were frustrated by the poor design of its peripherals (things like keyboards and printers), so it ultimately did not capture the market. RCA persisted, developing the Spectra 70 series in 1964. These computers were both compatible with some software written for the fairly popular IBM System/360, and cost far less, making them very attractive to consumers. This strategy paid off in the short term for RCA, and the Spectra 70 Series sold quite well… until IBM struck back with its System/370 in 1970. This was the same year that David Sarnoff stepped down as RCA’s chairman and was replaced by his son Robert Sarnoff, who launched a final, last-ditch effort to wrest some of the computer market share away from IBM. This was ultimately unsuccessful, and the following year, the company split the Computer Systems Division, and sold one part to UNIVAC, and the other to Digital Equipment Corporation. This was disastrous for RCA—when they sold the division, they took a $490 million loss, the largest that any American company had ever suffered. After the division was sold, RCA terminated most of its computer-related research. It was in this context, then, that Weisbecker worked. He began at RCA in 1953, and worked in the Computer Systems Division before he joined RCA Labs in 1970, but he hadn’t given up on computers. He thought that rather than going into mainframes, RCA should target home users. To demonstrate the feasibility of this idea, he developed a low-cost microprocessor concept called the Flexible Recreational and Educational Device, or FRED. 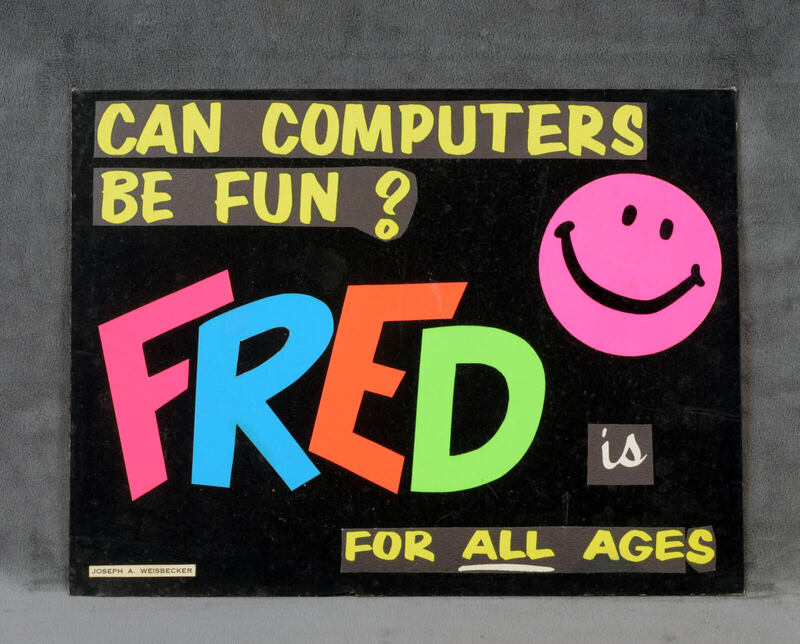 The FRED concept first materialized as hardware in the System 00, which he demonstrated to his bosses at RCA, all the while being careful not to use the verboten word ‘computer’ in his descriptions. Weisbecker continued to design FRED prototypes throughout the 1970s, while he oversaw the development of new microprocessors. “Minimum system cost,” Weisbecker wrote in a 1974 article about his concept, “is the primary goal.” This objective fit in well with his lifelong ambition of democratizing computers and making them part of everyone’s daily life. Crucial to the low-cost of his system was their architecture. The System 00 convinced his bosses at RCA that there was a future in home computing, and engineers began work on new chips. The first usable ones to come out of this were the RCA 1801U and 1801R, which, in 1976, were combined into one, the RCA CDP 1802, which was recently inducted into the IEEE Chip Hall of Fame. These were the first chips that used low power CMOS (complimentary metal oxide semiconductor) circuits, a more advanced version of the technology used in contemporaneous chips like the Intel 4004, and still the leading technology for modern processors. Microprocessors, however, were not high on RCA’s list of priorities, and the FRED project languished. It wasn’t until 1974 that the FRED system (now rebranded by RCA as the COSMAC) was made commercially available. That year, the company released the Microtutor, which relied on the two 1801 chips and three years later, in 1977, the company released the single-board RCA COSMAC VIP and the Studio II, both of which used the 1802, and both of which ended up being commercial failures. Despite these failures, the 1802 is still alive and well today, thanks, mostly, to the Elf instructions from Popular Electronics. 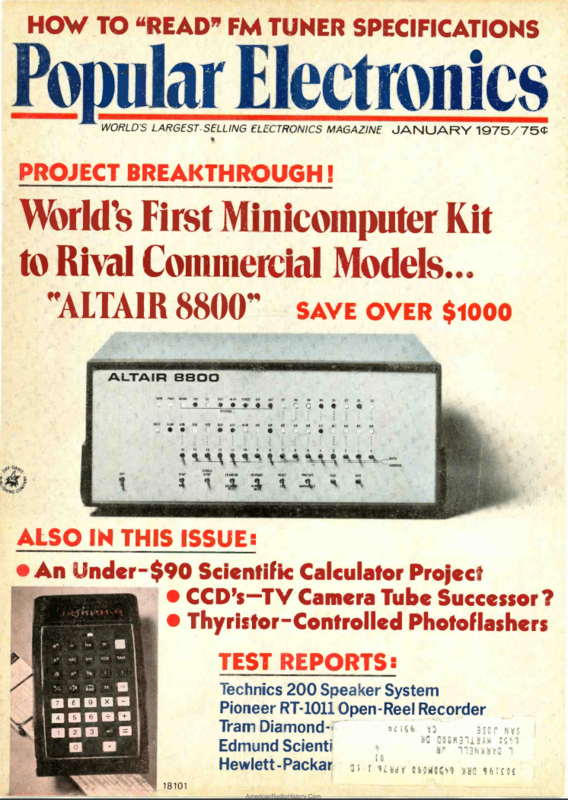 Beginning in the early 1970s (concurrent with the advent of the microprocessor), Popular Electronics editor Arthur P. Salsberg been keen on the idea of a do-it-yourself computer kit, and he tasked Les Solomon, the magazine’s technical editor, with finding the perfect one to feature in the magazine. Hobbyists throughout the country sent in ideas and designs, including Weisbecker, who in December 1973 sent a letter and a proposed article about using COS/MOS chips to build “a novel game computer.” In his cover letter, Weisbecker wrote that while “the hobbyist and independent inventor have been active participants in most areas of electronics[, …] they have been excluded from the computer field, one of the most rewarding and interesting fields for individual effort.” This was all changing, he continued, thanks to “the advent of the ‘computer on a chip’ or microprocessor.” These microprocessors, he prophesized, would lead to the widespread availability of inexpensive home computers. “It is the prime responsibility,” he continued, “of magazines such as yours to prepare your readers for this rapidly approaching microprocessor era in electronics.” The article he proposed was published in the May 1974 issue, but, as he promised, this article was but a “preliminary step” in this direction. 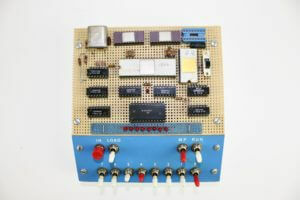 After the massive success of the Altair, Weisbecker returned to the pages of Popular Electronics, this time, with a simple device that people could build and program themselves, allowing users to get involved with it on both the hardware and software level. The Elf debuted in the August 1974 issue, and was followed by three more articles. The Elf was as stripped down as a computer could be, mostly because Weisbecker was determined that a lower price would bring more people into computing. “You’ll find,” he wrote in one of the articles, “that the Elf can be tailored to your needs at low cost.” Because of its design, it needed only a few chips to function, most notably, RCA’s newly developed CDP1802. 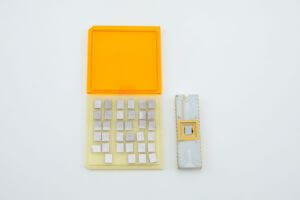 At its most basic, it had 8 toggle switches for program input, a hexadecimal LED display, and 256 bytes of RAM. Once users built it, they could learn to use it to write simple programs, and do everything from play games to monitor intruder-alert devices and more. All of this could be built for $80, compared to the nearly $400 that it would take to build the Altair 8800. The later articles gave readers more tips and tricks for the Elf. 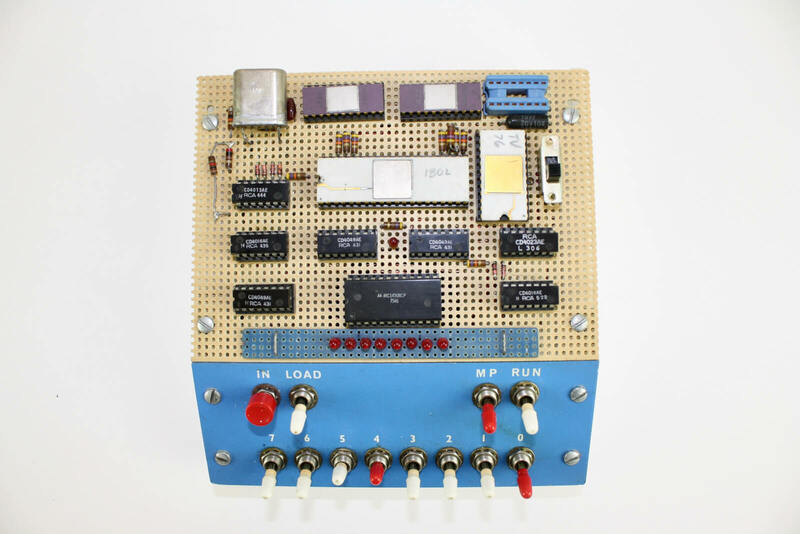 In the September 1976 issue, Weisbecker discussed how to build a lower-cost replacement for the hex display, how to add a hex keyboard to make programing easier, and how to include a 9-volt battery to power a RAM circuit for long-term memory storage. Part 3, in the March 1977 issue, discussed operating systems and how to add more memory to the device. The final article in July of 1977 explains how to add the CDP1861 LSI chip, which allowed Elf owners to display a 256-byte segment of memory on any CRT monitor (like a TV screen). Ultimately, the Elf, like most other 1802-based systems, wasn’t a huge success. Nevertheless, many people remember it with fondness. Its low cost and easy programing language made it especially attractive to younger people, and for many, the Elf was their first foray into computers. The Elf on the Sarnoff’s shelf is one of the ones that Weisbecker built. It has the 8-LED bulb replacement for the hex display described in the second Popular Electronics article, and it includes a video chip described in the final article. However, Elfs are more than museum pieces. People are still building them, or building reproductions, or even playing with a desktop emulator. This was the Intel-4004. For more, see Robert Noyce and Marcian Hoff, “A History of Microprocessor Development at Intel,” IEEE Micro 1 (1981): 8-22. For a first-hand account, see Federico Faggin, “The Making of the First Microprocessor,“ IEEE Solid State Circuits Magazine, 1 (2009): 8-21. RCA’s Selectron was a 256-bit electronic memory tube, and the world’s first dynamic random-access memory (DRAM) tube. Development began in 1946, when Jan Rajchman expanded on his earlier work with the Computron (an early attempt at a vacuum tube integrated circuit) in order to build a new form of high-speed memory for John von Neumann, who was building a computer at the Institute for Advanced Study (IAS) in Princeton, NJ. Though it was developed too late to be used there, the Selectron was used in the JOHNNIAC built at RAND Corporation on the model of the IAS machine. Slow data retrieval and storage speeds limited the utility of early computers. 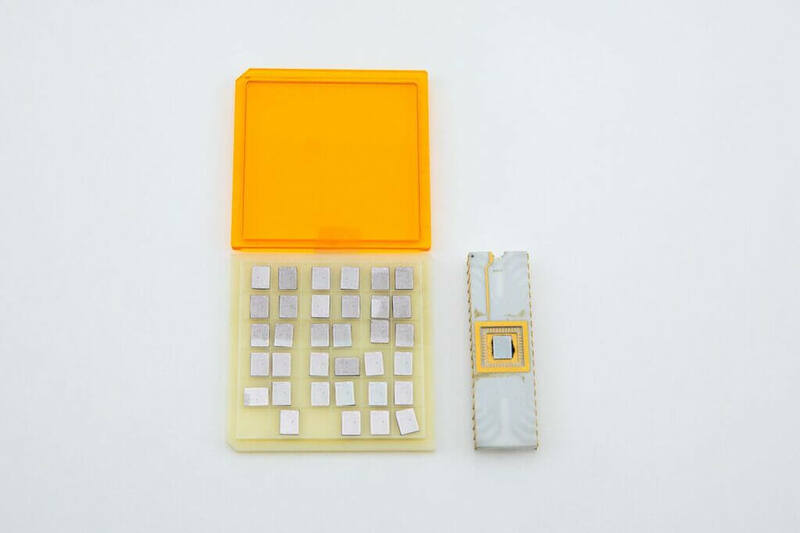 Working independently, Rajchman and a team of researchers at MIT developed a solution to this problem in 1952 by creating memory arrays consisting of a wire matrix with ferrite cores at each intersection. Core memory powered commercial computers until the end of the 1960s. Paul E. Ceruzzi, A History of Modern Computing, Second Edition. (Cambridge, MA and London: The MIT Press, 2003), 55-57. UNIVAC bought the customer base for the old RCA machines, and they continued to service them until they could transition their owners into UNIVAC mainframes, Ceruzzi, 163. Digital Equipment Corporation bought the manufacturing plant in Marlboro, Massachusetts, as well as the former RCA employees who worked there. Weisbecker resume, October 21, 1980. Hagley, Box 870, folder 1; P.K. Baltzer and J. A. Weisbecker, “A Proposed Private Venture,” Hagely, Box 871, folder 16. Joseph A. Weisbecker, “A Simplified Microcomputer Architecture,” Computer, 42. For more on this, be sure to check out our exhibit, Playing with Innovation: The Games of Joseph Weisbecker, on display at the Sarnoff until August 30, 2018. Stephen Cass, “Chip Hall of Fame: RCA CDP 1802,” IEEE Spectrum. Paul Freiburger and Michael Swaine, “Les Solomon: Favorite Uncle & Mentor of Microcomputing,” in Info-World, November 29, 1982: 29-33. Letter to Arthur P. Salsburg from Joseph A. Weisbecker, December 2, 1973.Hagley Library, David Sarnoff Research Center Records, 2464.09, Record group 11, Series VII Box 871, Folder 1. Joseph A. Weisbecker, “Build FLIP: A CMOS Game Computer,” in Popular Electronics, May 1974: 58-61. Weisbecker, Popular Electronics, March 1977, 67. Joseph Weisbecker, “Build the COSMAC “Elf”: A Low Cost Experimenter’s Computer,” in Popular Electronics, August 1976, 33. 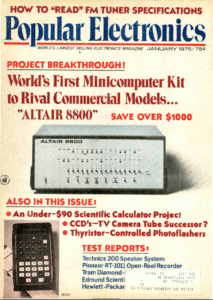 H. Edward Roberts and William Yates, “Altair 8800,” in Popular Electronics, January 1975: 33-38.